Overview - Academy Awardr-winner Ben Kingsley stars as a seemingly average citizen who plants five powerful bombs in different locations around a major city and threatens to detonate them unless his unconditional demand is met: The simultaneous release of four of the most deadly international terrorists from government prisons. His tactics are merciless. The risks are unthinkable. The manhunt has begun. But in an urban jungle already torn apart by fear, what could be the real motive behind a cunning madman's ultimate plan? Ben Cross co-stars in this explosive action-thriller about duty, justice and the unexpected vengeance of A COMMON MAN. Sir Ben Kingsley is an exceptional actor. From 'Gandhi' to 'Schindler's List,' the man has starred in some incredible films, and he even has a much deserved Oscar as a further testament to his great abilities. With all that said, despite his many accolades and high standing within the industry, his choices in projects can sometimes be a little… perplexing. After all, this is a man who somehow thought it was a good idea to be in 'The Love Guru' and Uwe Boll's 'BloodRayne.' Coupled with this knowledge, I was a little worried about his latest effort, 'A Common Man' -- but nothing, and I mean nothing, could have prepared me for what I was about to experience. A truly rare cinematic anomaly, the flick is an almost inexplicable oddity that gradually escalates in hilarious incompetence until it reaches genuine "so bad, it's good" territory. A remake of a purportedly well-received 2008 Indian thriller (titled 'A Wednesday! '), the movie follows a vengeful man (Ben Kingsley) who has planted several explosives around the city of Colombo, Sri Lanka. He then calls the police and demands that the government release four notorious terrorists from prison. If they don't comply, he'll blow up the bombs. Faced with little options, a police chief (Ben Cross) attempts to track down the would-be bomber and his weapons before it's too late, but there might be more to this apparent terrorist than first meets the eye. In its first twenty minutes or so, 'A Common Man' might fool one into thinking that it's just another run-of-the-mill, mediocre thriller. As its runtime progresses, however, it reveals itself to be an entirely different beast. The first couple of scenes are fairly solid and give little indication of the humorous problems that will soon follow. Focused on Kingsley's character planting his explosives around the city, there is very little dialogue and the director does a decent job of creating some visual tension and drama. Unfortunately, once the actors start to speak, things take a turn for the worst… or perhaps for the best, I'm still not sure. You see, all of the film's dialogue appears to have been added in post production, and with the exception of Ben Kingsley, the movie features some of the worst dubbing I've heard in a very long time. Though the film is in English, and the actors seem to be speaking English on set, I have a pretty big hunch that most of the supporting cast can't actually speak the language, and their voices are clearly being provided by separate voice actors. Separate, truly terrible voice actors. This leads to an extremely distracting and inadvertently comical disconnect that is plagued by utterly bizarre performance choices and syncing problems. Every ounce of tension is immediately deflated by the stiff, oddly affected vocal performances, and the actual dialogue itself rarely makes much sense. As written, most of the characters have zero personality and they speak in clumsy, overly formal sentences that reveal little grasp of the English language. And the few supporting players that do have a bit more charisma, are nothing more than utterly laughable clichés that look and sound like they've just walked out of a decades-old B-movie (the computer hacker with an attitude and sunglasses is my favorite). Even more distressing (or amusing, as the case may be) is the fact that the physical performances are also unintentionally hilarious. Out of place facial expressions, awkward pauses, inappropriate smiling, poorly timed glances, and silly reaction shots are all common place. Oscillating between too intense, or nowhere near intense enough, the supporting actors never seem to know how their characters should actually be feeling in any given moment -- so they just throw random emotions at the screen hoping that they'll eventually get it right. They don't. While the foreign cast features the most egregious offenders, Ben Cross ('Chariots of Fire') is also sadly terrible. Unlike Kingsley, his ADR work is atrocious and his line readings are painful. To his credit, Kingsley himself offers a much more sincere performance, and he does his best with the underwhelming material. That doesn't amount to much, mind you, but it's nice to see that he's not completely phoning it in -- even if his character is literally phoning it in during his short screen time. Looking beyond these glaring performance issues, the core of the script is kind of interesting, but the execution is extremely bland and pedestrian. Most scenes simply involve cutting between shots of Kinsley and Cross talking on the phone together, and while the camera might swoop around a bit, there isn't a whole lot of excitement to be had. The editing is also a little iffy, and some scenes end in abrupt transitions that are very jarring. A ridiculous chase sequence/fight scene is thrown in to spice things up, but the action has very little motivation, comes out of nowhere, features poor stunt work, and turns out to be completely pointless. A hackneyed twist is also exposed in the third act, and while I could potentially see this idea working under different circumstances, here it ends up making little sense. A perfect storm of building ineptitude, 'A Common Man' ends up being strangely entertaining -- just not in the way that the filmmakers intended. As the movie's bizarre inefficiencies become more and more apparent, the experience becomes more and more enjoyable, and there really are some laugh-out-loud, unintentionally funny moments peppered throughout that will likely have some viewers scratching their heads in disbelief. Hell, at times the performances and dialogue are so impossibly stilted and out of place that the flick starts to play out more like some kind of Adult Swim parody than a genuine drama. Don't get me wrong, as a legitimate thriller this is a total mess, but as a "so bad it's good" misfire it's surprisingly fun. I have absolutely no idea why Ben Kingsley (or even Ben Cross) agreed to be in this, but I'm actually grateful. This is one of the most amusingly terrible films I've seen in quite some time, and while a turkey like this might have hurt any other actor's reputation, somehow it only makes Sir Ben Kingsley even more badass. It's not exactly a new masterpiece of terrible cinema, but it might make a fun rental for those who enjoy horrible B-movie filmmaking. 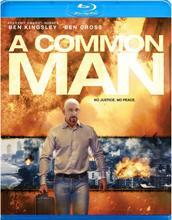 Anchor Bay brings 'A Common Man' to Blu-ray on a BD-25 disc housed in a keepcase. Some skippable trailers play upon start up before transitioning to a standard menu. The release is region A coded. The movie is provided with a 1080p/AVC MPEG-4 transfer in the 1.78:1 aspect ratio. Despite a few inconsistencies, this is actually a strong transfer with sometimes impressive clarity. The digital source is mostly pristine, but there are a few odd shots here and there that look like they were filmed using lower grade equipment. In these brief instances, overall clarity is less distinct and artifacts like noise and shimmering become visible. Thankfully, these occurrences are rare, and the majority of the presentation features a sharp image with a great sense of fine detail and dimension. The color palette veers toward a predominantly cool cast but certain hues (like yellows) pop nicely. Contrast wavers slightly from shot to shot, and while a few scenes can look a tad dim, white levels have a frequently blown out appearance. On the opposite end of the spectrum, blacks are deep and inky while maintaining good shadow delineation. While the movie's performances have significant issues, the visual production value is decent. The quality does falter slightly in a few scenes, and the blown out white levels aren't always appealing, but the transfer as a whole is quite solid. The film is presented with an English Dolby TrueHD 5.1 track and no subtitle options. When it comes to music and effects this is a robust and fairly professional sounding mix. When it comes to dialogue, however… well, that's another story. As I mentioned in the movie review portion, all of the speech seems to have been very poorly dubbed in post production and with the exception of Ben Kingsley, there are notable sync issues. Likewise, the dialogue has a slightly muffled quality and lacks the full-bodied fidelity found in other releases. Thankfully, the rest of the soundstage is well produced. The score is crisp and features nice separation and wide dynamic range. The sound design offers an effectively immersive experience, creating a spacious sense of environment. Atmospheric effects like traffic are spread naturally around the soundstage, and audio pans tied to moving characters and objects are smooth and natural. Bass activity can be just a hair overpowered for my tastes, but low frequencies provide a nice, deep kick to explosions and certain music cues. Ignoring the atrocious dubbing (which is more of a production and performance issue than a technical problem), 'A Common Man' sounds pretty good, offering a fairly enveloping experience. We get absolutely nothing here, and while a part of me would love to learn more about how this odd little movie came into existence, I think I prefer the mystery. 'A Common Man' is an unintentionally hilarious misfire that starts off decent enough but gradually becomes increasingly incompetent. Filled with truly atrocious dubbed performances and nonsensical dialogue, I'm having a hard time understanding how this movie exists. On the technical side, the disc features surprisingly solid video and audio. Not so surprising, however, is the fact that there are no special features. As a legitimate drama this is terrible, but some might find entertainment value in the B-movie style dubbing, editing, and acting (I did). If you're feeling adventurous, it could be worth a rental. I dare you.